Not good at maths and don’t want any holes in your walls? Well this is the dartboard set for you! Perfect for the games room or anywhere in the home, this is fantastic entertainment for the entire family, you can play solo or with up to 8 players and ensure you don’t have any arguments about who does the scoring or actually scoring correctly because The One180 Electronic Darts set does it all for you. It comes complete in a fantastic moulded cabinet with walnut insert and includes 12 darts including 40 spare tips which perfectly fit within the cabinet. The 4 LED displays the awesome scoring system and it comes with 27 fantastic games with a huge 259 game variations. Save 10% off the Regular Price! Superb Soft-Feel quality fibre dart mat with rubber underlay. - Official tournament specification oche measurements. - Versatile, light weight, easy to roll up and store away. - Stylish modern design. 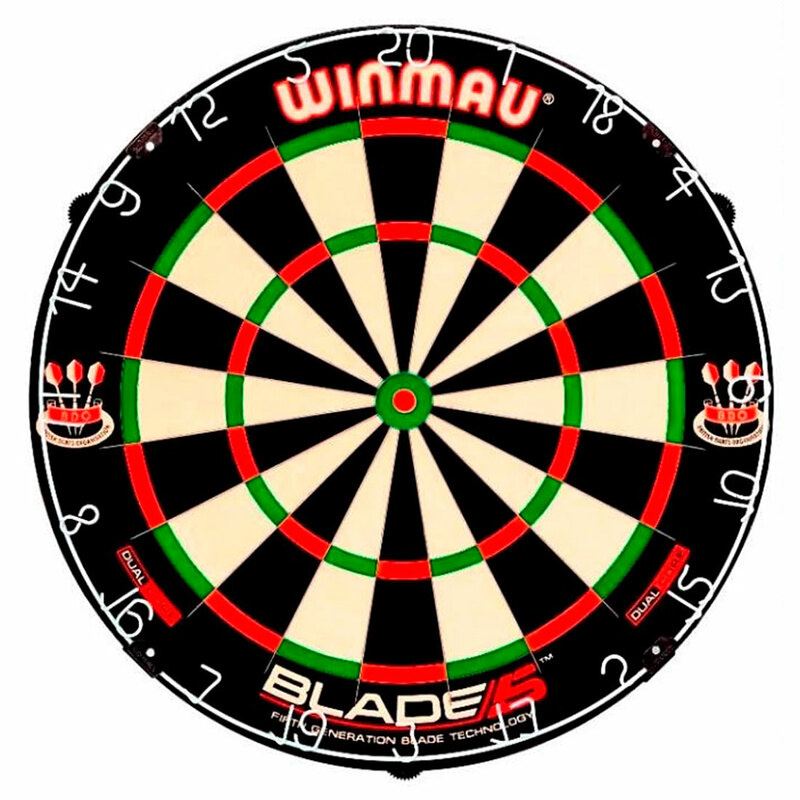 This dartboard is most suitable for beginners and novice players. With the "spider" stapled rather than embedded into the sisal. This allows the sisal to move more freely over the entrire board when it is hit by an incoming dart, this in turn results in increased longevity of the dartboard. Bristle Dartboard with Staple Free Bullseye. Non fade colours - High quality - Full size 18" x 1 1/2" Board. With the addition of the One80 Dot Trainer Dartboard we now stock 998 different sets of steel tip darts, 146 soft tip darts, 1238 dart flights, 500 dart shafts, 231 dart accessories, 45 darts cases plus 63 dart specials. We have also introduced 458 new darts products over the last 6 months. The superb new design adds an extra dimension to compliment your home or pub darts set up. As you can see from the image, this packet of goodies contains everything you need to hang you favourite dartboard. Below is another image with detailed measurements to ensure that when you hang the dartboard it is at regulation height etc. The 3 clamps come complete with wall plugs and screws. Although a little complex to install once they are in position they will last a lifetime. The following are the necessary instructions to install the clamping system so we suggest you read prior to purchasing. 1. Select a safe place to mount the dartboard (dartboards should not be placed on the back of doors!) allowing plenty of room for the playing area. 2. From the floor, mark the wall at a height of 59 and 1/8 inches (1,502mm). 3. Now hold the dartboard against the wall with the bottom edge of the dartboard (No. 3 segment) on the height mark from above (1,502mm). This will position the Bullseye at the correct playing height of 68" or 1,727mm. 4. Mark the wall directly underneath the No. 15 and No. 16 segments around the curve of the dartboard. 5. Take the bottom brackets (small pieces x 2) and hold against the wall with the rubber pad of the legs facing uppermost in line with the pencil line you have just made. Once in place mark holes through the bracket. Drill and fix the brackets using screws and plugs provided. 6. Place your dartboard into the bottom 2 brackets and mark around the top edge of the dartboard at the 20 segment. 7. The top bracket (largest piece) should be positioned with the rubber leg facing down and 3/8" (10mm) lower than the wall marking you have made (this will ensure the board is held securely). Once level hold the bracket in place and mark the wall through the 4 holes, drill and fix the bracket to the wall. 8. Once all 3 brackets are securely attached to the wall simply insert the dartboard with the No. 20 directly under the top bracket then push up and drop the bottom of the dartboard into the 2 bottom brackets always ensuring the dartboard is fully engaged before playing.